The Apprentice Companies and GYD Company are for serious dancers looking for additional performance and training opportunities. Please see Apprentice I, Apprentice II or GYD Company for more information. For more information or to register for the audition please contact: guelphyouthdance@gmail.com or call 519-803-8829. Please wear dance clothes (all black preferred) and be prepared for a warm‑up/technique class. · Completed a minimum of one year of dance training for Apprentice I, two years for Apprentice II and 3 or more for GYD Company. · The ability to commit to all rehearsals and performances in the season (Sept–May). 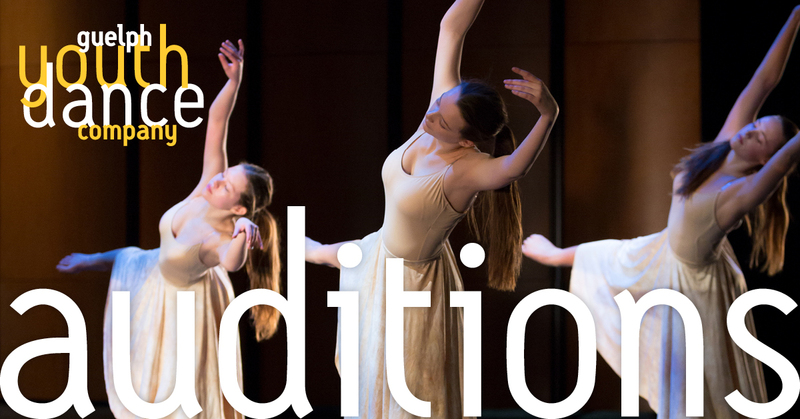 There are changes to the expectations for the dancer whether they auditioning for the Apprentice I, Apprentice II or Guelph Youth Dance Company. This audition is often the young dancers’ first experience being observed and evaluated for something that they are very keen to be a part of. It is part of the experience to feel nervous! We also do want it to be a positive experience. For all 3 levels of companies, we need to know the dancer is very committed; auditions tell us ahead of time who is interested and shows us who is committed. In addition, the auditions make it clear to the dancer that this is a special opportunity above and beyond their regular dance classes and that you will have to work hard! You will only be told ahead of the audition time if we have any concerns regarding: irregular attendance or if there were discipline issues during the year, or if a dancer is coming with no prior dance experience. This is step up from Apprentice I with higher expectations. Apprentice II dancers must have at least 2 years previous dance experience. Most dancers who show commitment, great attendance, kindness toward their fellow dancers and excellent discipline will be accepted into the Apprentice II company. Some dancers may be asked to do some extra classes, such as conditioning and an extra ballet class as mandatory classes in order to be accepted. In the Guelph Youth Company, we strive for excellence and a high level of professionalism. The Guelph Youth Company has been invited to tour Internationally and work with a variety of guest dance artists. For this reason, only those that show a high level of training, commitment, peer support, punctuality and attendance will be accepted. Dancers may be asked to join the company under the condition that they do extra training or may be asked to take on the role of Understudy. A guest teacher is brought in to teach a contemporary technique class. Janet Johnson, Catrina von Radecki and Kelly Steadman are all present at the auditions to observe and take notes. Though all three teachers often already know the dancer auditioning, this is often the first time that we see them together with the dancers who will make up the company. Though a dancer might be doing fine all year, this comparison with the other dancers may affect our decision on how they are placed. The decision as to who is accepted into each company is made by the three teachers after discussion and reflection. We hope that dancers will take all decisions as incentive to continue to work hard and to inform them on what specific skills they may be need to work more towards. Despite having a strict policy that asks for commitment from dancers, sometimes it is unavoidable for dancers to miss rehearsal. As choreographers are given a very limited time to create and perfect a work, it is essential that they have all bodies in the space each week. An understudy will fill in for a dancer who is missing. This role allows for extra training in learning movement material and seeing the piece as a whole. An understudy may also be asked to fill in during a performance if a dancer is injured or sick. The understudy must always be ready to perform! What does an understudy do during a rehearsal? Always thinking of ways to support the choreographer and the work. Pre and post check ins with the choreographer to ask how you might be most helpful today. Learn movement material which the full group is doing as well any specific roles that you are asked to learn. You should also be documenting, taking notes, learning counts, etc..
You may work directly with the Rehearsal Assistant to learn parts.